Jason C. Huang, Ph. 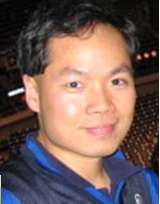 D.
Dr. Huang�s main research interests are the development of MHC class II tetramer platform for vaccine evaluation and studies of disease mechanisms. His laboratory is also involved in the studies of pathogenesis of nasopharyngeal carcinoma and influenza immune response. Dr. Huang is in the process of developing of MHC class II tetramer platform based on common Taiwanese HLA-DR alleles. The DR tetramer will be used for EBV and influenza studies and vaccine evaluation.